City Music alumna Clare Hammond (DMA Music, 2012) has starred in a film alongside Dame Maggie Smith. Released in cinemas in November 2015 and on DVD in March this year, The Lady in the Van is a film adaptation of Alan Bennett’s play of the same name. Directed by Nicholas Hynter, it tells the true story of the unexpected relationship between Alan Bennett (Alex Jennings) and Miss Shepherd (Dame Maggie Smith) after the latter parks her van in his driveway and proceeds to live there for 15 years. The film received a positive critical response and was nominated for a Golden Globe and a BAFTA. 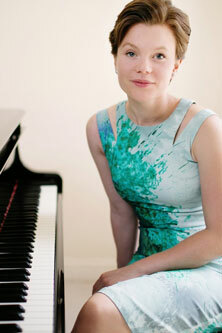 Clare plays the role of the younger Miss Shepherd, portraying her years as a pianist. The role, Clare says, involved “a fair amount of piano-playing and a small non-speaking acting part.” She completed the filming in two days at the Shoreditch Town Hall and a location near Regent’s Park and then spent time in the studio recording music for the soundtrack. Most of Clare’s appearances in the film are based around a concert scene where she performs excerpts from Chopin's first piano concerto with the BBC Concert Orchestra. During the scenes, Clare says it was easy to play Miss Shepherd as she just had to focus on performing the music. “There is a short scene in the middle of the film, however, where I play her as a nun,” Clare said. Although I don't speak, I do have to register shock and remorse which, given that I had absolutely no acting experience, was quite a nerve-wracking ordeal. Fortunately, Nick Hytner and the rest of the team were incredibly supportive and were able to lead me through the scene. George Fenton composed a great deal of absolutely wonderful music for the film itself but he decided to use existing pieces by Chopin and Schubert to identify key moments in Miss Shepherd's life. The Chopin, in particular, becomes the emotional key to the film. By the end, it has so much emotive resonance and so many almost painful associations that it's absolutely heart-rending. Before joining City, Clare completed her undergraduate studies at Cambridge University, where she gained a double first. In 2015, alongside filming Lady in the Van, Clare also released Etude, her second disc for BIS records, performed at seven festivals across Europe and played on BBC’s ‘In Tune’ Christmas Special. Clare has also recently completed a tour in Poland premiering a recently discovered concerto by Mozart’s mentor Josef Myslivecek.